The After-School Plus (A+) Program, the first program of its kind in the nation, provides statewide after-school services for public elementary students at affordable rates. The program addresses the "latchkey" child problem by providing a high quality after-school program to children of working parents/legal guardians or children whose parents/legal guardians are engaged in job training or attending school during the hours of A+ operations. If your child qualifies and you want to enroll him/her, please complete the registration form and return it to the school. The monthly fee covers regular program activities, The fee will be adjusted for those who qualify if acceptable supporting documentation about their income or DHS 728 From is submitted. Hours: After school - 5:30 p.m. The program hours are from after school to 5:30p.m. on regular school days. The program will not operate during school vacations, state holidays, weekends, Teacher Institute Day, Teachers' work day and school half days. At each school, the staff will consist of a site coordinator and a group leader team supported by aides to maintain a staff to student ratio of 1:20. Staff recruitment may limit the number of students that a school can serve. Parents/legal guardians of children may pick-up children with an ID and only after signing out the child. Other adult individuals authorized to pick-up your child from the facility must be indicated on the registration form. A child departing the A+ program unaccompanied must be authorized, in writing, on the registration form. (Please consult the site coordinator.) Any changes in departure authorization must be received in writing from the parent or legal guardian. Children usually begin the afternoon with free play time and a snack period (children bring their own snacks from home.) 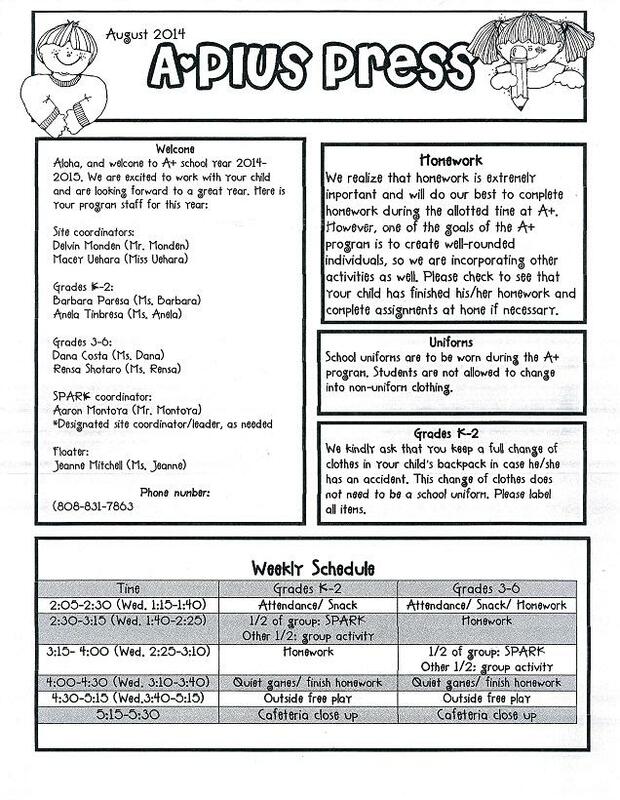 This period is followed by other activities including homework time, enrichment and physical fitness. Site coordinators will have the flexibility to adapt scheduled activities to meet the conditions at school. 2) printed business checking account. Starting date for your child is usually the first full day of school. However, the starting date of the A+ program may depend on the after-school enrollment of at least 20 children and the ability to recruit necessary staff.